Within the Interministerial infrastructure coordinating board session that took place on 7 July 2017, technical, legal and financial aspects that are typical for this phase of the M10 project realization were covered. Concerning technical aspects, it is important to emphasize the status of design documentation and data provision to prospective offerors. 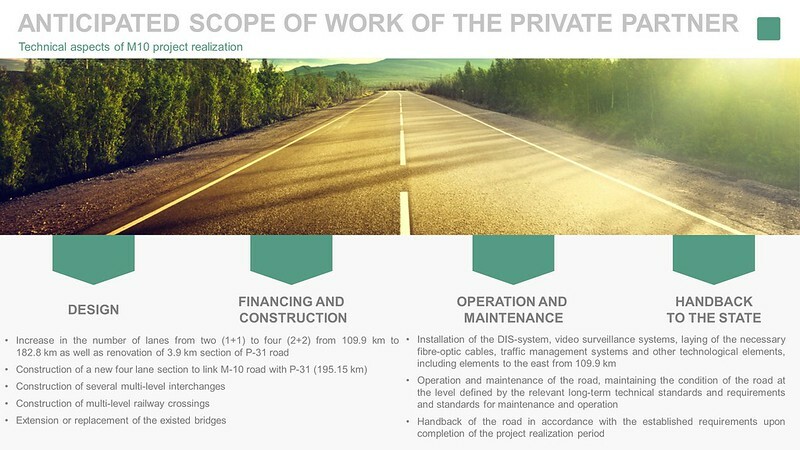 At the moment, all five stages of the architecture project on reconstruction M10 road successfully passed and obtained positive conclusion of the State expertise. Within the framework of the next meeting of the Interdepartmental Infrastructure Coordination Council held on July 7, 2017, among other issues the following ones were covered – technical, legal and financial aspects of the implementation of the first pilot project "Reconstruction of the M-10 highway of the border of the Russian Federation (Selishche) - Gomel-Kobrin from 109.9 to 195.15 km", which is being prepared in cooperation with the European Bank for Reconstruction and Development. According to the approved architectural project, within the framework of the project implementation it is assumed to reconstruct the M-10 four lane roadway with a length of 85.25km. All four-lane road sections will be of 1B category (4 lanes x 3.5m (2+2), there will be an emergency stop lane with a width of 2.5m at the edge of the road and dividing strip width of 2.7m at the center of the road). As a result of the analysis of the socio-economic project efficiency, both by the design organization and by independent consultants, it was concluded that the project has a high social economic efficiency. More information on the expected scale, as well as the project's situational plan, can be found in the infographics below. 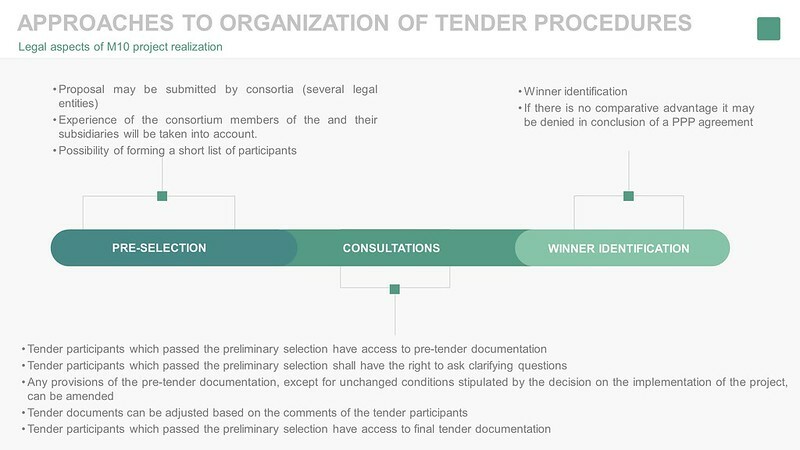 Concerning the legal aspects of the project, approaches to the development of a normative legal act are presented – decisions on the project implementation, current status and information on land and property needed for the project, approaches to the organization of competitive procedures for selecting a private partner, the proposed schedule for subsequent phases of the project that can be found on the infographics below. As a mechanism for the return of private partner investments, use of payments for operational readiness is proposed, the volume of which is directly related to the productivity of the private partner and the compliance of technical and operational parameters of the road section specified in the PPP agreement requirements. 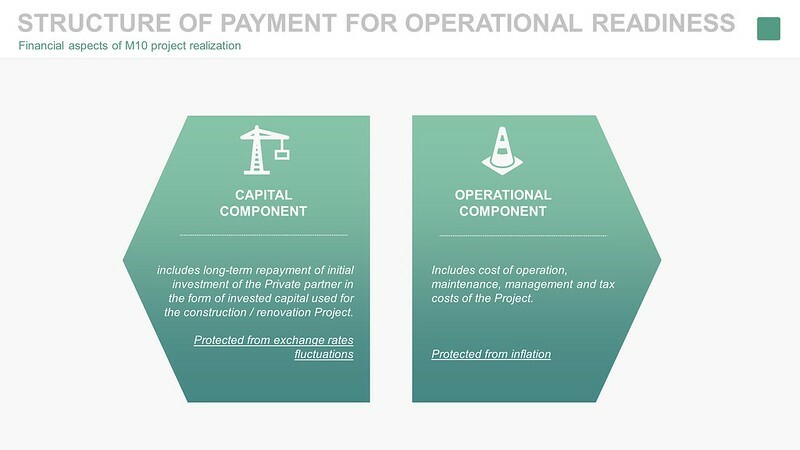 It is expected that payment for operational readiness will include two main components: a capital component which is aimed to provide long-term repayment of the investment of the private partner and to protect from exchange rate changes; an operational component which is aimed to cover costs of operation and maintenance, management and tax costs of the project (it will be indexed in accordance with inflation in the Republic of Belarus). What concerns risk allocation, it is assumed that more significant risks on design, construction, financing and operation will be under responsibility of the private partner, while demand risk, risk of land provision, political, currency and inflation risks will be take over by the public partner. Considering the above-mentioned factors and issues during the analysis, the following result was obtained – realization of the project under the PPP mechanism provides more comparative advantages then traditional public procurement scheme in long term. Now it is expected to receive opinions and approvals in accordance with the procedure stipulated by the legislation of the Republic of Belarus, as well as subsequent preparation and launch of tendering procedures for selecting private partner. PPP Unit of the National Agency of Investment and Privatization will inform about further steps in preparing the project for implementation.